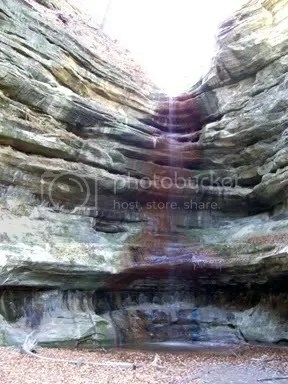 Canyons at Starved Rock – Let's Paint Nature! I had the fortunate opportunity to escape to Staved Rock in Utica, IL this weekend! 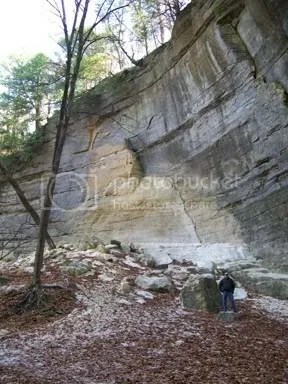 Starved Rock is about an hour and a half west of Chicago. The area contains miles of trails and several canyons with waterfalls! This canyon is magnificent. The picture does not give justice to it’s massive scale. Do you see the red, green, and blue colors in the rock? I’m sure there’s a scientific reason for those specific colors. I don’t know what it is, I just think the colors are beautiful! Do you see a human? Wow, the walls are huge! The floor is speckled with white in this picture, even though it was 35°F, there was no snow. 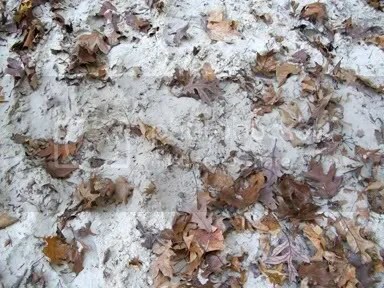 The white color you see is sand! The walls of the canyon are sandstone. The floor of the canyon is sand, just like at the beach, but the color of the sand is bright white. It was a little tough to walk through in hiking boots, but well worth it! Wow, very cool. That first photo is awesome. That is an amazing rock formation. The colors from the waterfall are quite nice. How lucky you are to live so close to such a beautiful place. Magestic! The the red, green, and blue colors in the rock similar to the Grand Canyon! When I stood above the Canyon that was the color that surrounded me! We certainly are dwarfed when standing near such nature wonders! Drowsey: Thanks, when you’re there its so magnificent, words are hard to describe it! Joan: Who would think that the flat lands of Illinois can hide something so wonderful! Thanks! You’d probably appreciate the Niagara Gorge, as well. It always makes me feel very small & insignificant, yet happy.